Clone Wars Bloopers: Ep. 3.12 "Nightsisters"
Welcome to the first installment of Clone Wars Bloopers! Here are the mistakes I found after watching the episode multiple times. I hope you enjoy! Okay, first off I noticed that the laser cannons on Ventress's Fanblade Starfighter were not quite right. Below you can see that when she's attacking the Resolute's bridge that both lasers are firing at the exact same time. Who knows if it was meant to be that way or it actually is a mistake. Next, when Asajj crash lands in the hanger you can clearly see the Fanblade on the rear of her Starfighter is still attached. Yet a few seconds later it's gone! Was it ripped off? Did it get vaporized? Your guess is as good mine. Speaking of the Hanger, Take a look at this. At first it looks to be a normal sized hanger for a Providence-class Carrier, we know what it looks like because the The Invisible Hand (seen in ROTS)is just like it. As you can see it's not near that big. You can especially notice it when the Jedi leave(below). Toward the end of the duel Ventress begins to lose her Lightsabers. First, Obi-wan kicks her against one of the wings of her Fighter causing her to drop one of of them. Next, Obi-wan pulls a move on Ventress similar to what Vader does to Luke in TESB, causing her to lose her second saber. (The way it's thrown it looks like it could have landed near the Jedi's Starfighters). A few seconds later the ship crashes and Ventress escapes back to her ship, she couldn't have had time to get her Lighsaber's back... Could she? Later when her Starfighter is brought on board the the Pirate's salvage ship you can see that she still has them. And again when she arrives on Dothomir. On to the next one! Here's one that some of you may have noticed already. Back during the battle when Ventress appears to be defeated by Anakin and Obi-wan, a Droid bomber explodes and and comes careening into the hanger. That's not a Droid Bomber... it's.. a Y-Wing? Wait.. what? It's a Y-wing again? I'm confused! Next, Look into hanger, clean as a whistle. Next thing you know there's a bunch a droids running around just begging to get run over. Moving on, we come to the flashback scene with Ky Narec. In the second flashback, Narec slashes one of the Weequays in the stomach and force pushes him into a wall but you can see he doesn't get a scratch. Narec then attacks the second Pirate cutting straight through his leg, miraculously he doesn't get injured. In another flashback when Ventress and Narec are fighting off Pirates he does it again. He slashes the weequay across the chest but no harm is done, it only sends him tumbling backwards(I thought I was watching an animated version of Return Of The Jedi, if you know what I mean). Later on when Ventress and the Nightsisters are infiltrating Dooku's palace, Asajj starts cutting a hole for them to enter through. She inserts her Saber and slices a bit to the right before cutting straight down to the ground. The next shot shows the top cut to be much longer than it appeared just a second ago, how could this be? With all the blunders in this episode it was still awesome, one of the best of the season in my opinion. 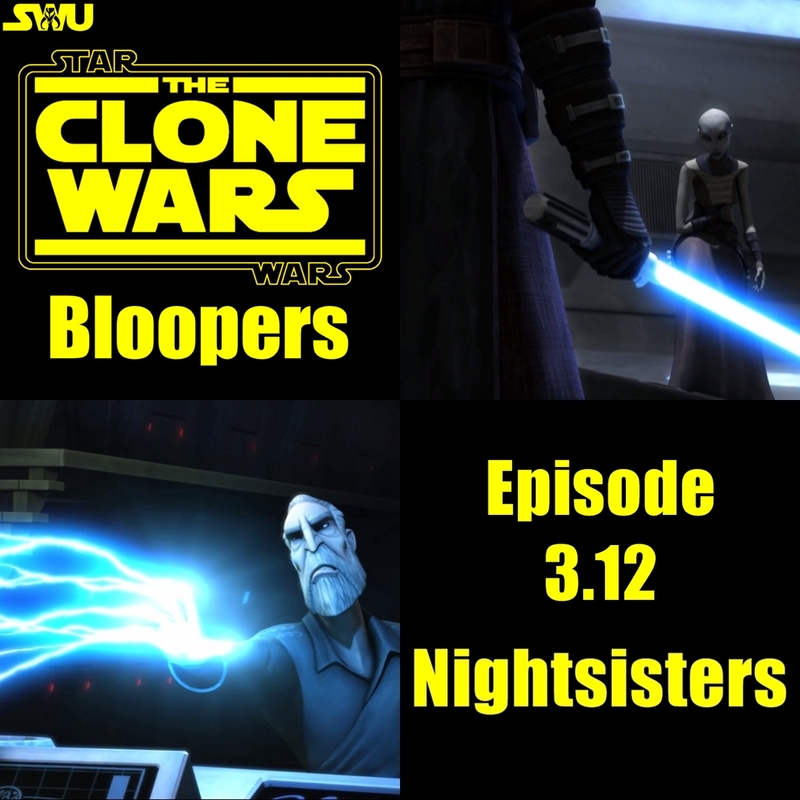 I hope to release more editions of "CW Bloopers" in the future assuming the Clone Wars crew will give me something to talk about.